Choose any Generation, Size, Color! 45 Day Guarantee! IPOD IS ORIGINAL GOT IT FROM APPLE IPOD IS STILL NEW NOT USED COMES WITH GENERIC HEADPHONES AND GENERIC USB CABLE FAST SHIPPING WHAT YOU SEE IN PICTURE IS WHAT YOU GET IF YOU HAVE ANY QUESTIONS PLEASE ASK. all colors available. No music! Subcategory: Nano. Generation: 3rd. Category: iPod. This is NOT the iPod Touch, it does NOT have Wi-Fi , bluetooth, or apps. Again, no bluetooth, we will not accept returns on that. It has a 2-inch screen. You are looking at a BRAND NEW Apple iPod Nano 7th Generation 16GB Blue (mid-2015, so darker color blue) This came straight from Apple to us! It comes in a white box that was sealed when it arrived to us, we only opened it to verify the color. iPod is in mint condition and never turned on. White box was only opened to verify color, came to us sealed. Shipped next business day! Comes without retail box, shipped as pictured. Bundled with generic, unbranded earpod headphones and lightning adapter cable. Please select SquareTrade Warranty at checkout for iPod warranty. Trending at $229.00eBay determines this price through a machine learned model of the product's sale prices within the last 90 days. What's Included: iPod Only. Works great and looks good with lite signs of use and a tiny nick in the glass at a corner. Trending at $125.00eBay determines this price through a machine learned model of the product's sale prices within the last 90 days. New ListingApple iPod nano 7th Generation Slate (16 GB)...EXCELLENT WORKING CONDITION!!! Condition is Used. (HAS one dent on back andONE scratch. ). Battery life is not compatible with my marathon running. 4.5 out of 5 stars - Apple iPod nano 7th Generation Slate (16 GB)...EXCELLENT WORKING CONDITION!!! 250 product ratings250 product ratings - Apple iPod nano 7th Generation Slate (16 GB)...EXCELLENT WORKING CONDITION!!! What's Included: iPod Only. Works great. Display has LCD lines. all colors available. Price drop! Apple ipod nano 6th gen Graphite 8gb. There is a good size crack in the screen. It does not effect functionality. This is for the iPod, and a charging cable. The iPod is in perfect working condition. New! 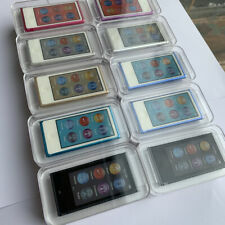 Apple iPod Nano 7th or 8th Generation 16GB (Choose Your Color) Warranty! 5 out of 5 stars - New! Apple iPod Nano 7th or 8th Generation 16GB (Choose Your Color) Warranty! 91 product ratings91 product ratings - New! Apple iPod Nano 7th or 8th Generation 16GB (Choose Your Color) Warranty! Apple iPod Nano 6th Generation Blue (8 GB) MP3 Player - Bundle . Condition is Used works great vomes with new usb cable. Shipped with USPS First Class Package. This iPod Nano is in good working condition. This iPod was powered on, wiped, and reset to default settings via iTunes. The screen also has very light scratching. We keep a smaller portion of each sale. Trending at $25.31eBay determines this price through a machine learned model of the product's sale prices within the last 90 days. 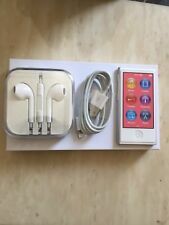 Apple iPod Touch - 4th generation - 16GB Storage. 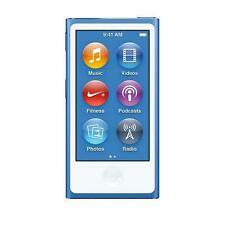 Apple iPod nano 7th Generation Blue (16 GB). Shipped with USPS First Class Package. Refurbished iPod in Good condition. USB Charging Cable. The item doesn't include original box. Model: A1285. This 4th Gen iPod Nano is in very great condition overall. The body of the iPod is in excellent condition, with only light wear. The iPod includes over 800 songs in mostly Pop, Rock, and Hip-Hop genres. Trending at $59.00eBay determines this price through a machine learned model of the product's sale prices within the last 90 days. Apple iPod nano 6th Generation Green (8 GB) Mp3 Player Used Has A Few Minor Nicks/Scrapes Around Case and Edges View Pic But in Good CONDITION. Apple ipod Nano 4th Generation 8, 16 GB - 30 Day Warranty! 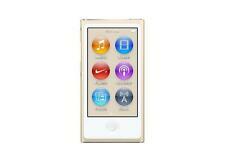 Up for sale is a pre-owned iPod Nano 4th Generation 8GB -- Gold (MB748LL), It's in excellent condition,fully functional, every key works properly.Its battery was newly replaced, plays music for about 26 hours. Apple iPod Nano 7th, 8th Generation 16GB *Used* (Choose Color) 45 Day Guarantee! 5 out of 5 stars - Apple iPod Nano 7th, 8th Generation 16GB *Used* (Choose Color) 45 Day Guarantee! 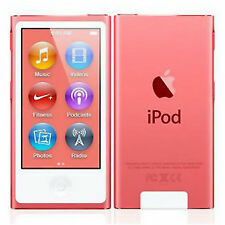 5 product ratings5 product ratings - Apple iPod Nano 7th, 8th Generation 16GB *Used* (Choose Color) 45 Day Guarantee! All colors. Please see description on condition. The iPod is in good condition and fully functional. Trending at $72.98eBay determines this price through a machine learned model of the product's sale prices within the last 90 days. 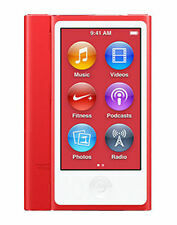 This red Apple 8 GB MP3 is great sounding, exciting, and capable of playing your music and videos when you are on-the-go. The abundant internal storage capacity found on the Apple iPod music player makes it easy for you to load umpteen song titles for access at your convenience. Trending at $79.97eBay determines this price through a machine learned model of the product's sale prices within the last 90 days. Apple iPod nano 3rd Generation Blue (8 GB). Condition is Used. Shipped with USPS First Class Package. Apple iPod nano 7th Generation Slate (16 GB)...EXCELLENT WORKING CONDITION!! !